This article is about the building material. For other uses, see Brick (disambiguation). Fired bricks are one of the longest-lasting and strongest building materials, sometimes referred to as artificial stone, and have been used since circa 4000 BC. 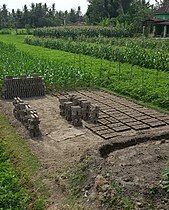 Air-dried bricks, also known as mudbricks, have a history older than fired bricks, and have an additional ingredient of a mechanical binder such as straw. The ancient Jetavanaramaya stupa in Anuradhapura, Sri Lanka is one of the largest brick structures in the world. The earliest bricks were dried brick, meaning that they were formed from clay-bearing earth or mud and dried (usually in the sun) until they were strong enough for use. The oldest discovered bricks, originally made from shaped mud and dating before 7500 BC, were found at Tell Aswad, in the upper Tigris region and in southeast Anatolia close to Diyarbakir. 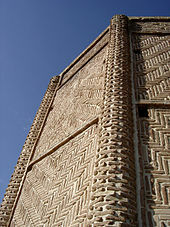 The South Asian inhabitants of Mehrgarh also constructed, and lived in, airdried mudbrick houses between 7000–3300 BC. Other more recent findings, dated between 7,000 and 6,395 BC, come from Jericho, Catal Hüyük, the ancient Egyptian fortress of Buhen, and the ancient Indus Valley cities of Mohenjo-daro, Harappa, and Mehrgarh. Ceramic, or fired brick was used as early as 3000 BC in early Indus Valley cities like Kalibangan. The earliest fired bricks appeared in Neolithic China around 4400 BC at Chengtoushan, a walled settlement of the Daxi culture. These bricks were made of red clay, fired on all sides to above 600 °C, and used as flooring for houses. By the Qujialing period (3300 BC), fired bricks were being used to pave roads and as building foundations at Chengtoushan. ...the kilnmaster had to make sure that the temperature inside the kiln stayed at a level that caused the clay to shimmer with the colour of molten gold or silver. He also had to know when to quench the kiln with water so as to produce the surface glaze. To anonymous labourers fell the less skilled stages of brick production: mixing clay and water, driving oxen over the mixture to trample it into a thick paste, scooping the paste into standardised wooden frames (to produce a brick roughly 42 cm long, 20 cm wide, and 10 cm thick), smoothing the surfaces with a wire-strung bow, removing them from the frames, printing the fronts and backs with stamps that indicated where the bricks came from and who made them, loading the kilns with fuel (likelier wood than coal), stacking the bricks in the kiln, removing them to cool while the kilns were still hot, and bundling them into pallets for transportation. It was hot, filthy work. Extruded – made by being forced through an opening in a steel die, with a very consistent size and shape. Dry-pressed - similar to soft mud method, but starts with a much thicker clay mix and is compressed with great force. Molded bricks – These bricks start with raw clay, preferably in a mix with 25–30% sand to reduce shrinkage. The clay is first ground and mixed with water to the desired consistency. The clay is then pressed into steel moulds with a hydraulic press. The shaped clay is then fired ("burned") at 900–1000 °C to achieve strength. Dry-pressed bricks – The dry-press method is similar to the soft-mud moulded method, but starts with a much thicker clay mix, so it forms more accurate, sharper-edged bricks. The greater force in pressing and the longer burn make this method more expensive. Extruded bricks – For extruded bricks the clay is mixed with 10–15% water (stiff extrusion) or 20–25% water (soft extrusion) in a pugmill. This mixture is forced through a die to create a long cable of material of the desired width and depth. This mass is then cut into bricks of the desired length by a wall of wires. Most structural bricks are made by this method as it produces hard, dense bricks, and suitable dies can produce perforations as well. The introduction of such holes reduces the volume of clay needed, and hence the cost. Hollow bricks are lighter and easier to handle, and have different thermal properties from solid bricks. The cut bricks are hardened by drying for 20 to 40 hours at 50 to 150 °C before being fired. The heat for drying is often waste heat from the kiln. 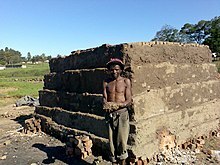 In operation, new green bricks, along with roofing bricks, are stacked at one end of the brick pile. Historically, a stack of unfired bricks covered for protection from the weather was called a "hack". Cooled finished bricks are removed from the other end for transport to their destinations. In the middle, the brick workers create a firing zone by dropping fuel (coal, wood, oil, debris, and so on) through access holes in the roof above the trench. 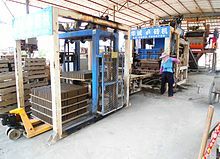 A concrete brick-making assembly line in Guilinyang Town, Hainan, China. This operation produces a pallet containing 42 bricks, approximately every 30 seconds. Bricks formed from concrete are usually termed as blocks or concrete masonry unit, and are typically pale grey. They are made from a dry, small aggregate concrete which is formed in steel moulds by vibration and compaction in either an "egglayer" or static machine. The finished blocks are cured, rather than fired, using low-pressure steam. Concrete bricks and blocks are manufactured in a wide range of shapes, sizes and face treatments – a number of which simulate the appearance of clay bricks. For efficient handling and laying, bricks must be small enough and light enough to be picked up by the bricklayer using one hand (leaving the other hand free for the trowel). Bricks are usually laid flat, and as a result, the effective limit on the width of a brick is set by the distance which can conveniently be spanned between the thumb and fingers of one hand, normally about four inches (about 100 mm). 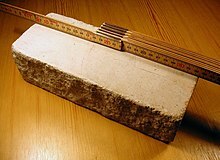 In most cases, the length of a brick is twice its width plus the width of a mortar joint, about eight inches (about 200 mm) or slightly more. 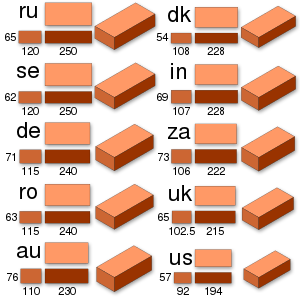 This allows bricks to be laid bonded in a structure which increases stability and strength (for an example, see the illustration of bricks laid in English bond, at the head of this article). The wall is built using alternating courses of stretchers, bricks laid longways, and headers, bricks laid crossways. The headers tie the wall together over its width. 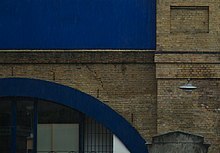 In fact, this wall is built in a variation of English bond called English cross bond where the successive layers of stretchers are displaced horizontally from each other by half a brick length. In true English bond, the perpendicular lines of the stretcher courses are in line with each other. More complex interior cavities allow improved insulation, while maintaining strength. A typical brick house in the Netherlands. ^ (in French) IFP Orient – Tell Aswad. Wikis.ifporient.org. Retrieved 16 November 2012. ^ History of brickmaking, Encyclopædia Britannica. ^ Yoshinori Yasuda (2012). Water Civilization: From Yangtze to Khmer Civilizations. Springer Science & Business Media. pp. 30–31. ^ Yoshinori Yasuda (2012). Water Civilization: From Yangtze to Khmer Civilizations. Springer Science & Business Media. pp. 33–35. ^ Ash,, Ahmed,. Materials science in construction : an introduction. Sturges, John. Abingdon, Oxon. ISBN 9781135138417. OCLC 896794727. ^ Peter Ackroyd (2001). London the Biography. Random House. p. 435. ISBN 978-0-09-942258-7. ^ "Henry Clayton". Retrieved 17 December 2012. ^ The Mechanics Magazine and Journal of Engineering, Agricultural Machinery, Manufactures and Shipbuilding. 1859. p. 361. ^ "US Patent 9082". Retrieved 26 September 2014. ^ "The History of Bricks". De Hoop:Steenwerve Brickfields. ^ Connolly, Andrew. Life in the Victorian Brickyards of Flintshire and Denbigshire, p34. 2003, Gwasg Carreg Gwalch. ^ a b McArthur, Hugh, and Duncan Spalding. Engineering materials science: properties, uses, degradation and remediation. Chichester, U.K.: Horwood Pub., 2004. 194. Print. ^ . Brick Industry Association. Technical Note 9A, Specifications for and Classification of Brick. Retrieved 28 December 2016. ^  bia.org. Technical Note 10, Dimensioning and Estimating Brick Masonry (pdf file) Retrieved 8 November 2016. ^ Michigan | Success Stories | Preserve America | Office of the Secretary of Transportation | U.S. Department of Transportation. ^ Schwartz, Emma (31 July 2003). "Bricks come back to city streets". USA Today. Retrieved 4 May 2017. ^ Romero, Simon (6 October 2007). "Rogelio Salmona, Colombian Architect Who Transformed Cities, Is Dead at 78". The New York Times. Look up bricks in Wiktionary, the free dictionary. 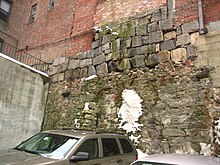 Wikimedia Commons has media related to Bricks. "Brick" . Encyclopædia Britannica. 4 (11th ed.). 1911.